As fixed indexed annuity (FIA) sales continue their meteoric rise, their risk profile has been increasing as well, according to an FIA market report from Fitch Ratings. The guaranteed income rider is a key factor in this trend. Ever since these riders debuted in 2006, they have been contributing to FIAs’ sales growth as well as to their risk profile increase, Fitch said. About those sales: Between 2007 and 2014, FIA sales rose by 93 percent, the analysts said, citing figures from LIMRA Secure Retirement Institute (LIMRA SRI). By comparison, sales of other fixed annuities declined by 1 percent in the same period, and sales of variable annuities declined by 24 percent. Along the way, FIAs grabbed market share too. 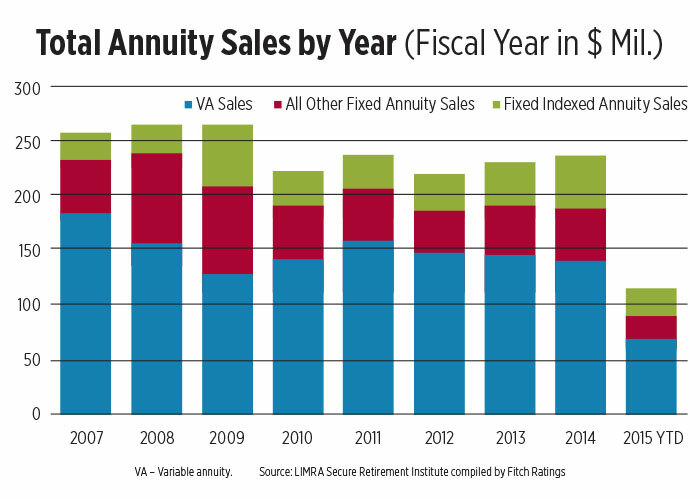 During the first six months of 2015, FIA sales represented 21 percent of all annuity sales, up from 10 percent in 2007, Fitch said. Several factors contributed to this growth, the analysts noted. 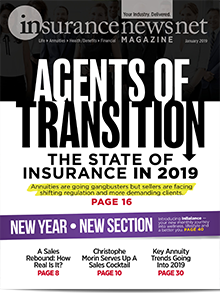 These include the low interest rate environment; the expansion of distribution into bank, broker/dealer and wire house channels; and insurers’ declining appetite for the risks associated with selling variable annuities (VAs). But income riders were “one of the main drivers,” the analysts said. The features also have become extremely popular. When the riders are available, for example, consumers elected them for 68 percent of annuity contract purchases, the Fitch researchers said, citing LIMRA SRI figures. This growth in income riders has not been without side effects. For instance, their incorporation in FIA products has increased the carriers’ “exposure to tail risk,” Fitch said. 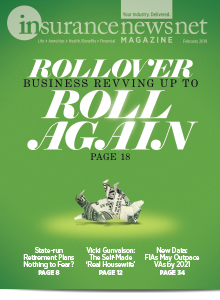 And since use of riders is a relatively new trend, not yet a decade old, “there is limited long-term industry experience around policyholder behavior,” the researchers said. They went on to report the riders’ relative newness means it is unclear how contract holders will behave in a rapidly increasing interest rate scenario or a significant equity market downturn. This is of particular concern since surrender charge periods have become shorter. Fitch’s report paints a much different picture of the FIA business than the researchers described in the pre-rider days. Back then, Fitch viewed the FIA business as being less exposed to interest rate risk than traditional declared rate annuities, the analysts said. The FIAs’ more modest base policy guarantees contributed to that assessment. So did the FIAs’ greater surrender charge protection and their use of market value adjustment features, they said. Also, the more stable profit margins historically associated with the FIA business as compared with those of traditional fixed annuities spoke to a less risk-prone assessment. The analysts attributed this characteristic to FIAs’ greater crediting rate flexibility as compared with that of traditional fixed annuities. Risk in the products is appearing from other trends too. For example, the Department of Labor's (DOL) proposed fiduciary rule, now awaiting release in its final form, is a looming factor. The proposed rule does not require FIAs to undergo the same compliance procedures and fiduciary contract that VAs do, the analysts allowed. However, “FIAs sold within a tax-qualified retirement plan (including individual retirement accounts) would be subjected to the new impartial conduct standards,” they said. The risk is that the new standards could impact commission rates, product design and FIA sales growth, Fitch said. The entry of private equity players into the FIA market presents another risk. 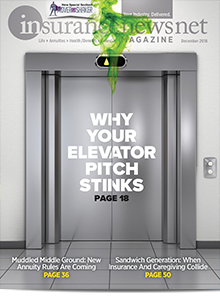 The trend began a few years ago, and as of June 30, four of the 10 largest FIA writers, based on sales, were owned by private equity firms, Fitch said. This “wave” of new entrants has caught the attention of regulators and spurred more stringent oversight, the analysts noted. As Fitch sees it, the risk here has to do with the firms’ overall business objectives. Still another risk the analysts spotlighted is the increased complexity of FIA products. 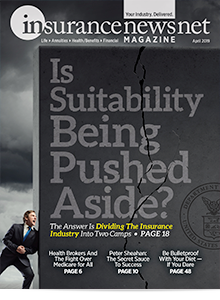 Although this gives policyholders more flexibility in choices, “whether FIA carriers have the proper risk control measures in place to handle the complexity is still largely untested,” the analysts said. The press copy of the Fitch report does not quantify the level of risk that Fitch has detected in the FIA market. 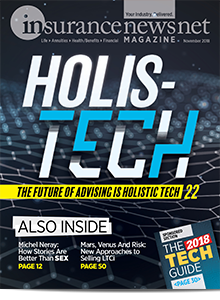 However, in the annuity business, if there is even the whiff of rising risk, that can put product availability, richness and pricing into play. Based on the report, the scent of risk is already in the air. 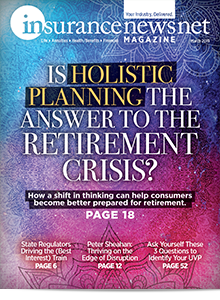 For annuity professionals, including those in other annuity lines as well as in FIAs, that means it’s time to watch for risk-based shifts in the FIA market.